You may have been wondering where I have been, or maybe you haven’t because lets face it to my disappointment I am not the center of the universe. But, I will tell you anyways. My life has been consumed with sorting, packing and organizing. Splitting my home into three categories. 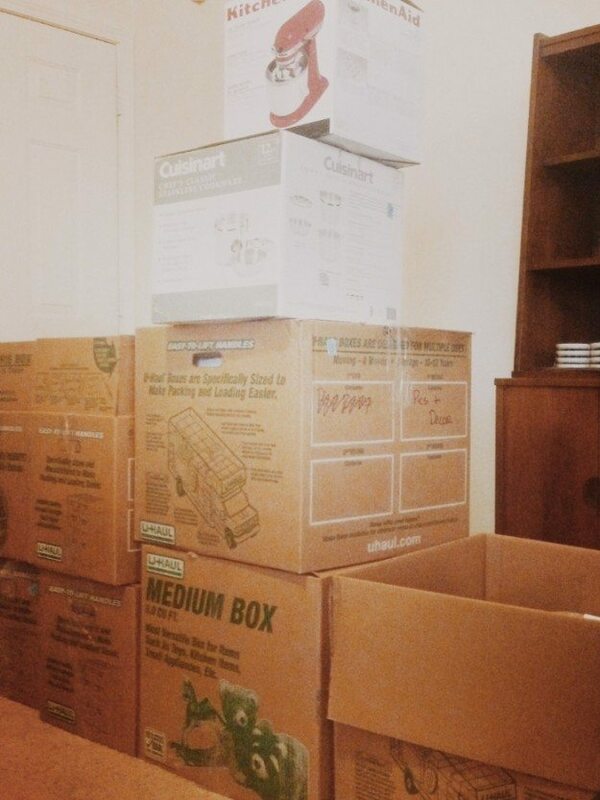 ; what goes in our new little home, what goes into storage and what goes up for sale. We have also simultaneously been doing some small repairs and facelifts. It’s been a busy month. The biggest challenge without a doubt is my kitchen and pantry. I have a ridiculous amount of spices, grains and kitchen hardware. I didn’t really realize how much until I started pulling things out of cabinets. 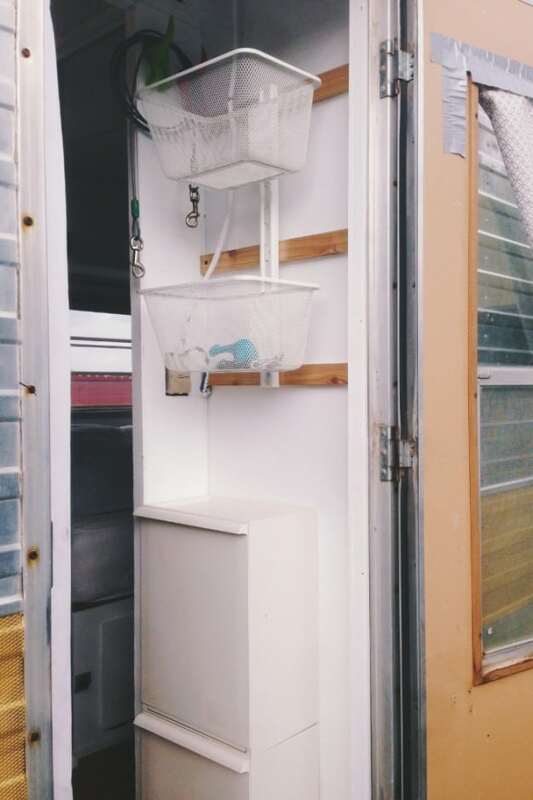 The pantry in our camper is very small. 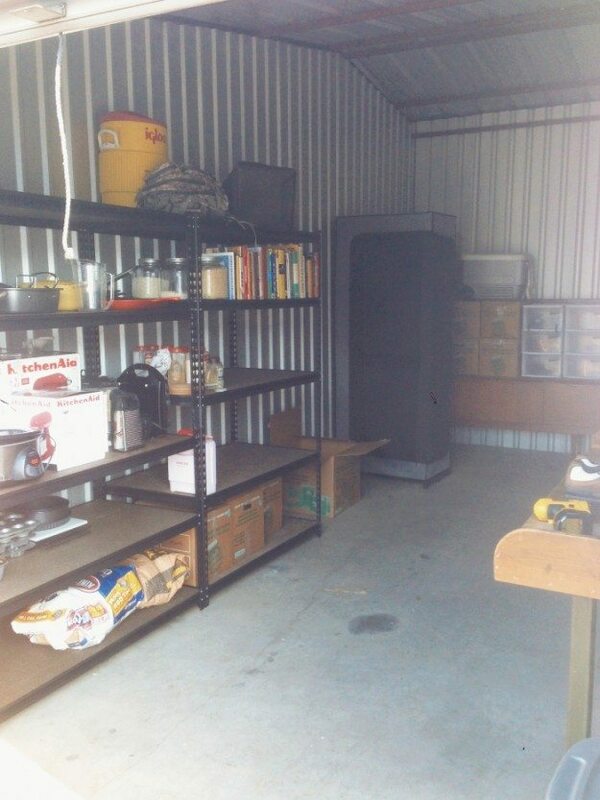 I figured the best way to keep it organized and optimize space was if everything was in the same type of container. 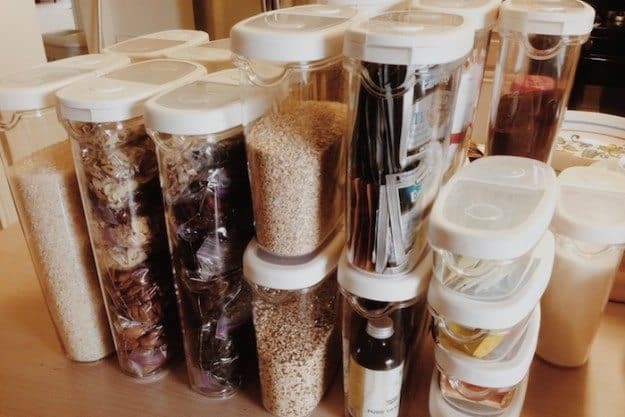 I went to IKEA and bought a whole bunch of containers to keep my pantry staples neatly organized. One of the other challenges is my spices. They took up practically an entire cabinet. 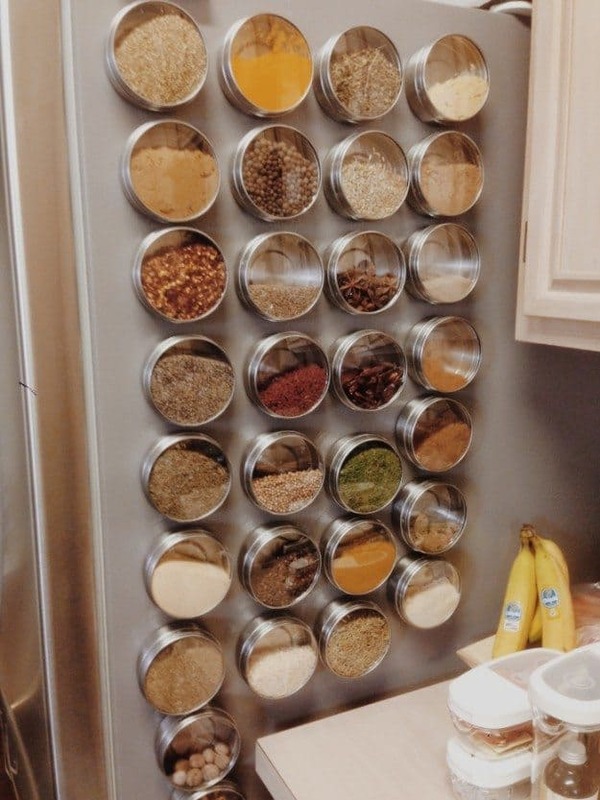 I knew that if I tried to store my spices in the cabinet they would take over and there would be less space for more important things like cookies and sugary cereals. Luckily I found the perfect solution! Magnetic containers that I can keep on the refrigerator door. I now officially love magnets! 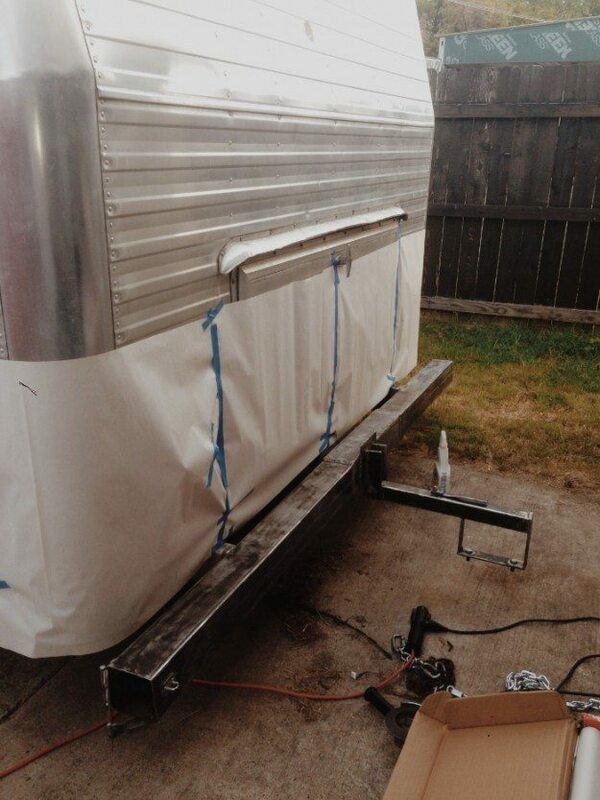 There is also a few things we needed to do to the camper to optimize our tiny space. 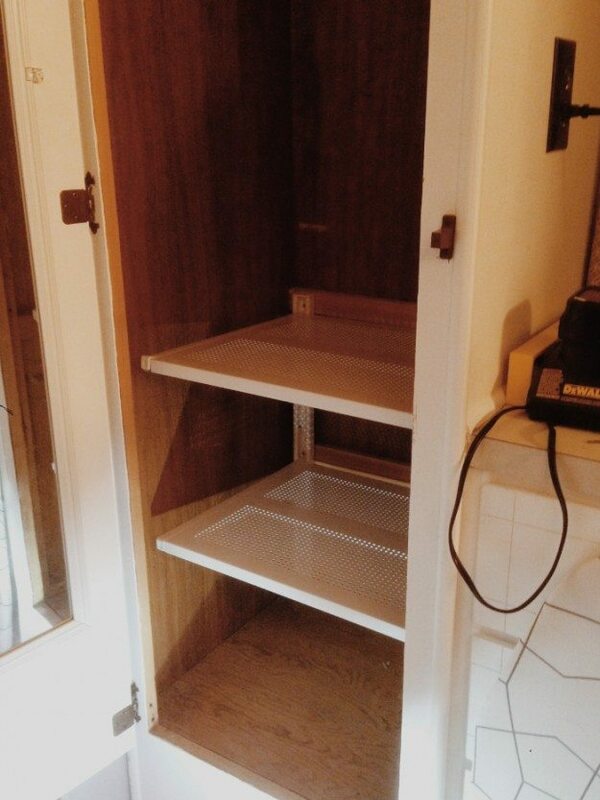 The closets, for example, are very tall, leaving dead space at the bottom of the closet so, we decided to install some shelves for shoe storage. I have never been so excited about shelf installation. Then there is the trick of optimizing counter space. The little kitchen has a little counter. 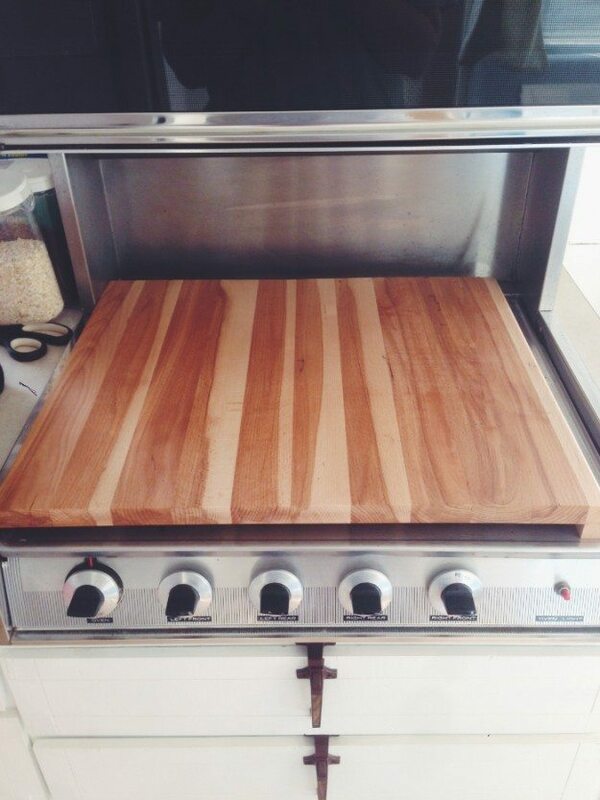 But, I found this cutting board that fits perfectly over the stovetop to optimize the counter space when the stove isn’t in use. And, it’s pretty!!! Another challenge was figuring out where we were going to keep the dogs food, and all there stuff like leashes, brushes, meds and treats. We installed some recycling bins to store dog food and baskets for all their stuff. It’s all about optimizing space. Finally there is our storage unit. We found a great place not even 2 minutes from the RV park! It’s perfect! We are organizing it so we can still easily find things and get in out out. The unit will house many of my small kitchen appliances, cookbooks, pantry overflow and props. And, whatever else OB wants to keep in there. We are in full countdown mode. By this weekend, our home will be a whopping 160 square feet. I am excited and nervous at the same time. I am already picturing what my days will be like. Early morning rises to walk the pups with a warm thermos of coffee, working outside under the awning while sitting at our little patio table and pretending I live in a fort. It’s also kind of become a weird challenge for me. Although, considering we are pretty much selling everything I don’t really have an option, but to submit to the challenge. Once we get moved in I will give you a little tour on how we optimized space and changed up a few things to make it feel more like home. Oh and how I cook in my new micro-kitchen. Eeeek! Love finding your site! Do you remember where you found your cutting board? I’m going through a similar transition although for a different reason – I live on the Big Island of Hawaii and our house may be in the path of the lava flow. So we’re packing up some stuff for storage, leaving enough in the house to camp out for a few months, then moving into our little truck camper/glamper until we decide what we’re going to do on a long-term basis. We’ll be living in a somewhat smaller space than yours, so it’s a challenge to figure out what to bring and what to pitch. We lived on a sailboat for 2 years and in a 5th wheel RV for 3 years, so we’ve learned some tricks for living simply but well. We didn’t have our 2 dogs then, though, so I was glad to see your idea for what to do with dog food, leashes, etc. Thanks for this post and good luck! I can’t believe it’s here – so exciting! And I can’t wait for the tour!!! For reasons I am too tired to analyze right now, I am very excited about your adventure in living small. I am fascinated by tiny homes.